Here is the list of best free hardware monitor software for Windows. These software let you keep a check on the performance and usage of various physical components of your computer. 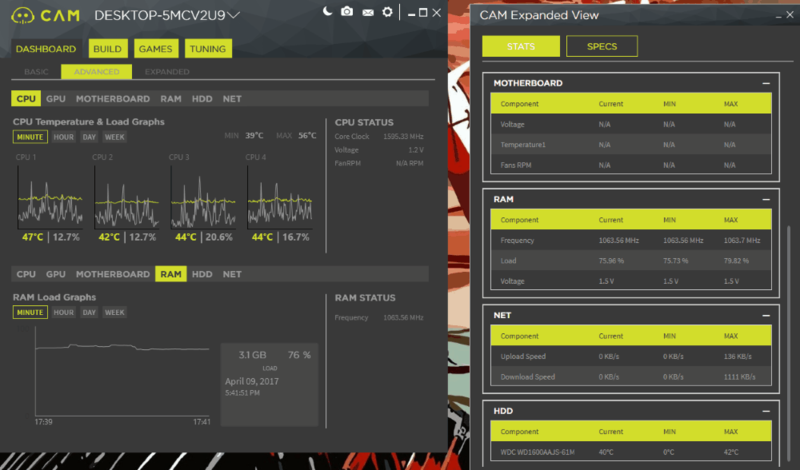 You can view real time statistics of your CPU, GPU, RAM, Hard Drives, Network Adapter, Motherboard, and other hardware. While using these, you can not only view statistics, but also view hardware info and specifications. These hardware monitoring software come in handy if you need detailed statistics, such as: CPU temperature, load, fan speed, clock frequency, RAM usage, hard drive usage, hard drive temperature, network activity, and more. Some of these hardware monitor software just display real time statistics, while some record statistic data history and display it on graph. Some of these software to monitor hardware also display minimum, maximum, and average values of readings. In case, you want to log hardware performance statistics, some of these hardware monitor software provide reporting feature. If you want to set up a computer to monitor hardware of remote computer, I have mentioned a remote hardware monitor software as well. It lets you monitor hardware activity of other computers just by entering their IP address, followed by username and password. There are various other features that these below mentioned hardware monitoring software provide. Go through the list to get a brief idea about them, and select the one which suits your need the best. Open Hardware Monitor is one of the best free software to monitor hardware. It not only displays real time usage of hardware available in your PC, but also plots graph for the statistic being displayed for a given period of time. You can also checkout the list of best free CPU Usage Monitor, CPU Temperature Monitor, and CPU Stress Test Software. Open Hardware Monitor keeps an eye on your computer’s hardware and provides real time performance statistics in numeric as well as graphical form. You can view CPU, GPU, RAM, and Hard Drive statistics at one place. It gives real time information on clock speed, temperature, and load on CPU cores, on CPU overall, and on GPU. RAM and Hard Drive usage, along with temperature can also be monitored. Along with real time stats, minimum and maximum values reached are displayed. Options to log hardware performance and display statistic plot make this freeware an amazing hardware monitor software. Log data is saved as text file on your PC. A very detailed plot can be viewed for various data readings of each CPU core, GPU, RAM, and Hard Drive. You can even vary the time window of plot to view statistics for long or short time duration. It is one of the best free hardware monitoring software available out there. WinUtilities Free is a system maintenance and cleanup software with a vast number of tools. One of the tools lets you monitor PC hardware and their performance. It lets you monitor CPU performance, memory device, GPU, network device, input/output devices, and more. Although it covers a good range of devices to monitor, the information and statistics displayed are not detailed. You can find this hardware monitor tool under Modules > System Tools > System Information. Here, you can do real time monitoring of total CPU load, RAM usage, and Paging file usage. Network Adapter info is displayed along with its name, type, MAC address, and more. Keep a check on all input and output devices connected to your PC including keyboard, webcam, ROM, USB devices, Printer, monitor, etc. Various reports can be generated using this software for various device types. Reports contain detailed info and description about devices. I would recommend this hardware monitor tool only if you do not need detailed info about hardware performance. It can only be used to keep an eye on the devices connected and view basic information about them. CAM provides detailed statistics and specifications of your computer’s hardware. It is a hardware monitor software, specially designed for gamers. It not only monitors CPU, RAM, memory, and motherboard statistics, but also monitors GPU. For user convenience, it displays data in 3 modes: Basic, Advanced, and Expanded. In the Basic mode, you can view real time statistics such as: CPU temperature, CPU load, GPU temperature, GPU load, Fan speed, RAM usage, and Hard drive usage. In Advanced mode, you get to view CPU, GPU, Motherboard, RAM, HDD, and Network Adapter usage statistics. The statistics displayed here are real time as well as graphical data. You can view statistic graph for last minute, hour, day, or week. Some additional info, such as CPU/GPU core clock speed, voltage, fan speed, ram frequency, etc. are displayed. The best part about Advanced tab is that, you can view 2 of any hardware’s stats at the same time. The Expanded mode is just like Advanced mode, but also lets you view hardware specifications along with statistics. The statistics are displayed in a list for the hardware available on board. Some additional tools provided by this free hardware monitor software let you view computer’s performance while gaming and also lets you overclock GPU for maximized gaming performance. You will not find any report logging options, presence of which would have been an advantage. CPU-Z lets you monitor limited number of hardware devices on your PC, but the important ones. You can view statistics and specifications of CPU, GPU, Motherboard, and RAM. Let us checkout briefly what all information can be gathered using this hardware monitor software. View CPU specifications and statistics, such as: processor name, package, core voltage, core speed, bus speed, cache info, etc. Motherboard info displays the components connected to it, info of Graphic interface connected, and BIOS brand and version. RAM type, channel, size, frequency, etc. are displayed. If a graphics card is connected to your PC, then GPU size, type, core, and product info are displayed. In addition, information of Motherboard Clock, CPU clock, and GPU clock can be viewed. The tools made available with this Hardware monitor software let you check for Driver and BIOS update. You can also save hardware report as text or HTML file. CPUID Hardware Monitor is another hardware monitor software from the makers of CPU-Z. Its a very simple software that only lets you monitor CPU core temperature, clock speed, and load along with Hard Drive temperature and utilization. For each of these parameters, real time values, minimum values, and maximum values are displayed. Save the hardware statistic report as TXT file if you want. Tools to check for Driver and BIOS updates are available with this freeware. System Information Viewer is another free hardware monitor software that displays hardware statistics and specifications. It gives detailed info about how your computer’s hardware are working. The hardware which this software monitors are: CPU, GPU, Hard Drive, RAM, Network Adapter, USB, etc. On the main interface, real time RAM usage, RAM latency, Paging File usage, and File Cache usage are displayed. Along with overall CPU and GPU usage, real time voltage, temperature, and power for each CPU and GPU core can be viewed. Even more detailed information about the mentioned hardware can be viewed in their respective sections. Not only usage and statistics of hardware, but hardware info and specifications can be viewed as well. This software is feature rich and fetches detailed information about CPU, RAM, USB buses, Fans, Volumes (HDD), Battery, and more. Advanced SystemCare Free is another system maintenance and cleanup software in this list to monitor hardware of your PC. It has a bunch of tools to help you keep an eye on your PC and fix issues. One of the tools, named System Information, lets you monitor hardware of your PC. Although the information provided is not detailed, you will get an overview of different hardware on your PC. Along with monitoring, you will be able to view hardware info and specifications. The hardware that you can monitor here are: Processor, RAM, GPU, Hard drives, Network adapter, Display device, Sound device, Mouse, keyboard, and USB devices. For CPU and GPU, you will be able to view real time performance along with a graph of CPU usage history. RAM usage and Kernel Memory status are displayed in the Memory device section. For the Network Adapter, MAC address along with specification are displayed. For other devices, their specifications, description, and status can be viewed. HWiNFO lets you monitor computer hardware of your computer as well as remote computer. It is an extensive hardware monitoring software that provides real time system monitoring and also displays hardware information. You can log hardware statistics to create extensive reports and easily share data. Virtual memory load and usage. Physical memory load and usage. CPU core clock speed, CPU core usage, total CPU usage, core temperature, and core ratio. GPU clock speed, GPU usage, and GPU memory status. memory clock speed, memory clock ratio, and memory command rate. Motherboard temperature, CPU temperature, CPU core voltage, etc. Drive temperature, drive usage, and drive read/write speed. Total download/upload, current download sped, and current upload speed. To monitor hardware on remote computer, you will have to enter the remote computer’s IP. If the computer is password protected, you will have to enter correct user ID and password. Logging hardware activity on this free hardware monitoring software is easy. Simply click on the Log button, and the current values on the screen will be saved as a CSV file. Speccy is that hardware monitor software which you need when you want to know what’s inside your computer. It scans and displays the hardware available inside your computer along with their specifications. View detailed information of the CPU, GPU, RAM, Motherboard, Storage, Audio device, peripherals, and Network Adapter connected to your PC. For some of the hardware, you can also view their statistics. Like, for CPU, you can view total load, core wise temperature, core speed, bus speed, etc. View RAM usage, motherboard voltage statistics, HDD storage statistics and temperature, and more. Its another good hardware monitoring software but is more inclined towards hardware specifications than statistics.